« Where do you, the eater, want your food to come from? 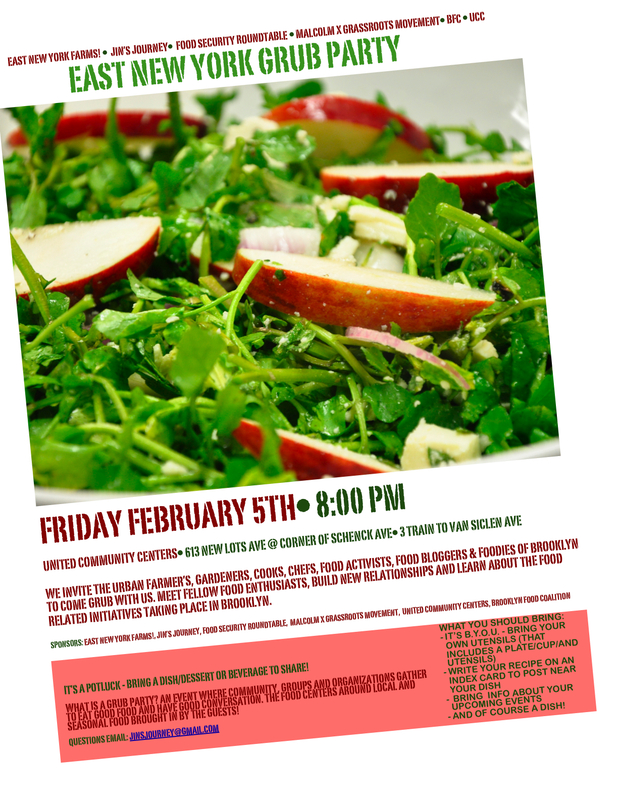 Join East New York Farms!, Jin’s Journey, Food Security Roundtable and Malcolm X Grassroots Movement, Brooklyn Food Coalition, and United Community Centers for a potluck Grub dinner on February 5th, 2010 at 8:00pm Bring your dish, your own plate, cup, and utensils, and write your recipe on an index card! We invite the urban farmers, gardeners, cooks, chefs, food activists, food bloggers & foodies of Brooklyn to come grub with us. Meet fellow food enthusiasts, build new relationships and learn about the food related initiatives taking place in Brooklyn. Sponsors: East New York Farms!, Jins’ Journey, Food Security Roundtable, Malcolm X Grassroots Movement, United Community Centers, Brooklyn Food Coalition. It’s a potluck bring a dish/dessert or beverage to share! What is a Grub party? An event where community, groups and organizations gather to eat good food and have good conversation. The food will center around local and seasonal food brought by the guests. This entry was posted on January 18, 2010 at 1:20 pm and is filed under Brooklyn Farmer. You can follow any responses to this entry through the RSS 2.0 feed. You can leave a response, or trackback from your own site.